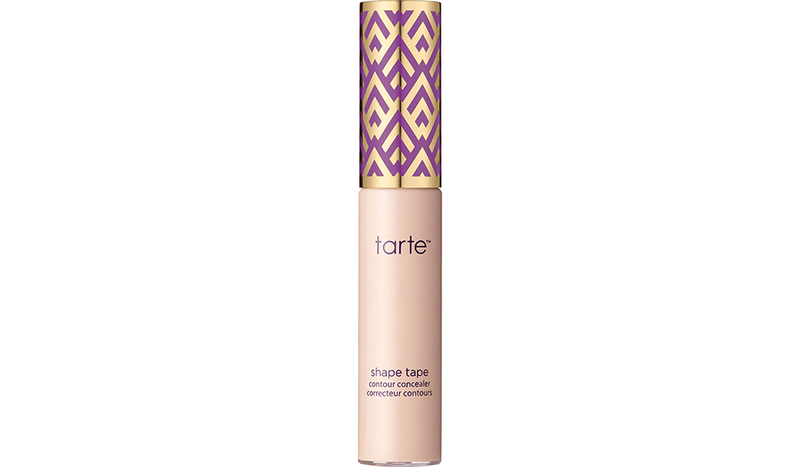 Just when we thought Tarte’s concealers couldn’t get any better (they are officially America’s number one concealer brand, after all), the brand launched ‘Shape Tape’ – and we were whole new levels of obsessed. One-hundred percent vegan and free from harsh nasties, ‘Shape Tape’ concealers offer full coverage with a matte finish, and will erase any blemish or imperfection in a flash. There’s no risk of flaking or creasing, and they’re loaded with nourishing skincare ingredients (licorice root, mango seed, and Shea butters) to illuminate and lift. They’re so good that one is sold every 12 seconds. Impressive. Available in 30 shades and five undertones, there’s one to suit every one out there, and — if that wasn’t enough — they can do so much more than just hiding blemishes. Savoir Flair sat down with the experts at Tarte to find out just what miracles this magic wand can work. Read on to discover 12 ways you can use the concealer that sells every 12 seconds. Start with three dots of ‘Shape Tape’ under the eye, where the most coverage is needed, and blend with our ‘Quickie Blending Sponge’. Use the custom doe-foot applicator and swipe the concealer onto your eyelids, blending out with a sponge or your fingers. Thanks to its long-wear, matte finish, ‘Shape Tape’ makes for the perfect base under any shadow. Place ‘Shape Tape’ on areas where you have the most redness and stipple with a small, fluffy brush. Apply after foundation for maximum coverage. In order to mask hyperpigmentation, use a ‘Shape Tape’ with a “honey” undertone closest to your skin tone to offset the pigmentation, then layer your perfect match over the top. Create dimension and brightness by using one shade lighter than your perfect match. Apply to the center of your forehead between your brows, down the bridge of your nose, under your brows, on the cupid’s bow, and on the center of your chin before blending with a sponge. Place the concealer directly onto the spot using the doe-foot applicator, one dot at a time, and blend using your fingertips. When camouflaging acne scars or texture, apply ‘Shape Tape’ in a downward motion and use a dampened sponge to press into the skin using a light, stippling motion. Using ‘Shape Tape’ in one or two shades deeper than your perfect match, swipe into the hollows of your cheeks, jawline, hairline, and down the sides of your nose and blend with a damp sponge. Use your perfect match shade and apply to areas with enlarged pores. Never blend upwards – instead, stipple lightly and blend with a damp sponge. Apply ‘Shape Tape’ on the back of your hand and pick up small amounts using the flat side of a damp sponge. Place the sponge where you have fine lines and lightly blend, making sure not to pull on the delicate skin. Remember that a little bit goes a long way! Use ‘Shape Tape’ in your highlight shade and place on areas that are receding and that you want to bring forward – for example, under the eyebrow, on the brow bone, or under the contour on your cheeks. Then, using your contour shade, add to any areas where you want to add depth such as in the crease of your eye or hollows of your cheeks. For the fullest coverage, apply directly to the area using the doe-foot applicator. Choose your shade depth with a honey undertone to cancel darker pigments and layer your perfect match on top. Blend out with your ring finger, let it dry, and repeat these steps if needed.